Chad Ryan, Luke Jones, Lavinia Draper, and Nick Brennan in Thank You For Being A Friend. BOTTOM LINE: Oh no, thank you! Thank You For Being A Friend: The Musical is, to put it mildly, a curious theatrical experience. 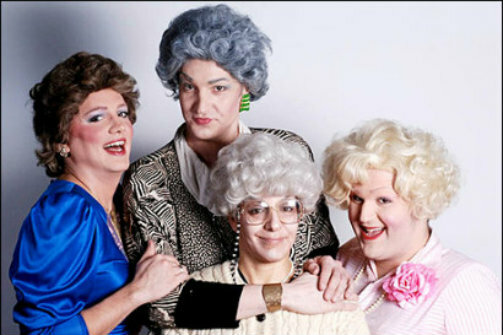 It is essentially a made-up episode of TV's The Golden Girls in drag with some famous musical theatre songs with re-worked lyrics thrown in for fun, and the most ridiculous (in a good way) excuse for a plot I have come across in many years. Like its source material, Thank You never fails to elicit fits of hysteria, gasps of embarrassment and outbursts of applause from the pre-show warning straight through to the “We Are Family” clap-along finale. For those not familiar with the 80’s sitcom The Golden Girls, I would recommend a pass on this show for it succeeds (as parodies often do) mostly on your knowledge of the original. Without that frame of reference, the hilarity of Thank You For Being A Friend: The Musical would be little more than three guys in drag, two guys not in drag and a girl in semi-drag running around being loud. But confident that its audience has seen an episode or two, the creators of this show go for broke. The most successful elements of the show are the three “ladies” playing the roles originated by Rue McClanahan, Bea Arthur and Betty White. With a likeness one cannot be fully prepared for, Chad Ryan, Luke Jones and Nick Brennan channel their original counterparts in mood and mannerism as well as physical resemblance, and it is mostly their virtuosity that keeps the show afloat. In an effort to not spoil the plot or any of the fun, I will say only that Jody Wood and Brad Loekle as the neighbors have the more difficult job of playing it straight (relatively speaking of course), but manage to pull it off admirably. Collectively the cast is an effective ensemble clearly relishing in the nonsensical madness that is this show. There was one element of the show, however, that left me perplexed: The character of Sophie (Sophia on the original show, played brilliantly by Estelle Getty), while a generation older than the other ladies, is still essentially part of the core group on the original television show, and, naturally, in the play. I remain unclear as to why Sophie was played (albeit brilliantly) by Lavinia Draper – the only actual female member of the cast. Was she a last minute replacement? Could they not find a guy to do it? Have I lost all ability to discern gender when someone is wearing a wig and is Lavinia Draper actually a guy? I really don't know, but whatever the case may be, I must confess that it did take me out of the show more than once as I wrestled with the age-old question: Is that a shadow or an Adam's Apple? But, as mentioned, she was brilliant so perhaps such quibbles are not really relevant. What is relevant is that this show is high camp done very, very well, and from the moment the lights went down until they came up again, a packed theatre was in absolute hysterics. If you have been dying to see an episode of The Golden Girls in drag—and really, who hasn't—then Thank You For Being A Friend: The Musical is must-see TV. I mean theatre.